Trailblazers Adventure Travel Pvt. Ltd. going by the tag line- The Outdoor School, has since 1994 impacted hundreds of thousands of campers, children, students, teachers, corporate executives, and professionals through fascinating outdoor experiences. Trailblazers programmes are carefully curated such that the reviews from visitors young and old alike have come back with memories of fun, adventure, learning and having a better understanding of themselves and the Planet Earth. Jungles, deserts, marshlands, snow covered mountains and now the ocean and river beds are all open to Trailblazers outdoor exploration. Experience the rush of adrenaline as you raft with us down rivers, or ski in the Swiss alps, enjoy a fascinating session on birding in the Sunderbans, or wildlife watching in Pench, and now introducing the thrill of scuba diving with the whales and sharks and see the architecture of the poriferans in the commonly termed coral reefs. Our young yet highly experienced and trained team of travel advisers, our liaisons with the best in the travel supply chain and fun as a key ingredient of our programmes makes Trailblazers an outstanding company to partner with to help you make your travel dreams come alive. We discover unique destinations and create extraordinary programmes that are difficult to resist. People, places, art, culture, history, geography, music, food - all climaxing to leave you spell bound asking for more, but it is time to pack up and write your own story of discovery, wonder and joy. We stick by some old school values that make us distinctly different and there is no compromise here. Our approach and all our travel programmes have the hallmark of Transparency, Ethical practices, ‘you ‘- first, policy, application of high safety standards, following the law of the land, adhering to environmental norms, respecting all people, cultures, religion, values and thoughts, non-discrimination, Trailblazers guiding team with a wealth of knowledge and following the best practice’s in the travel trade. To be a global leader in providing outdoor experiences that bring about learning for life. We aspire to transform people by providing enriching experiences that unveil the secrets and wonders of the outdoors, ensuring safety in all actions, following ethical business and sustainable environmental practices. Trailblazers has the most experienced hands in the camping industry. We are a group of people truly passionate about the outdoors, each with their own area of expertise. Ranjan is truly an outdoor person and nature lover. After his academics, he joined WWF India looking after the Western region first as Education Officer and then worked as Deputy Director. 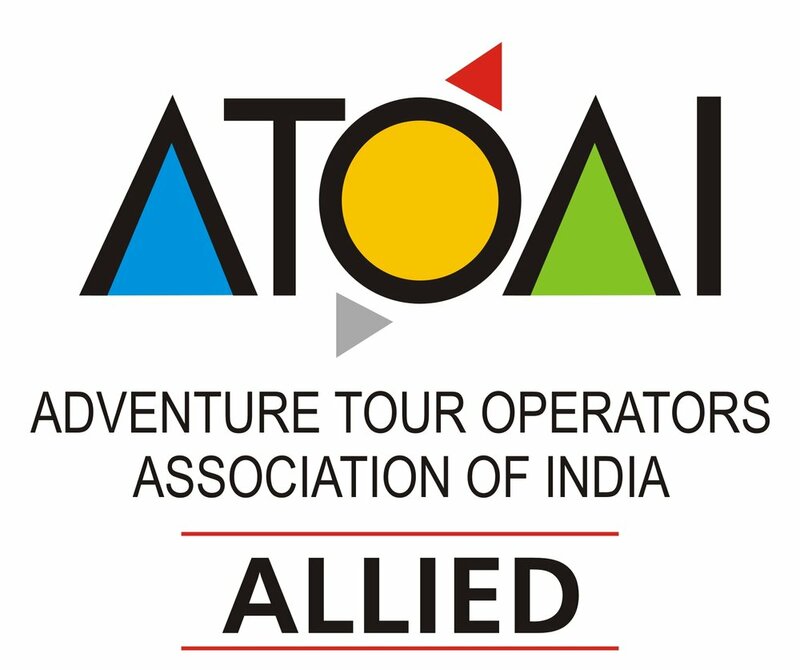 His passion for spreading his love for the outdoors led to the emergence of Trailblazers Adventure Travel Pvt. Ltd. In 1994. He has put over 1,50,000 students, teachers and professionals in touch with nature. He has been certified in Environment education and trained in Israel at the invitation of MASHAV (Ministry of Foreign Affairs – Israel). He has also worked under the legendary Sir Gerald Durrel. 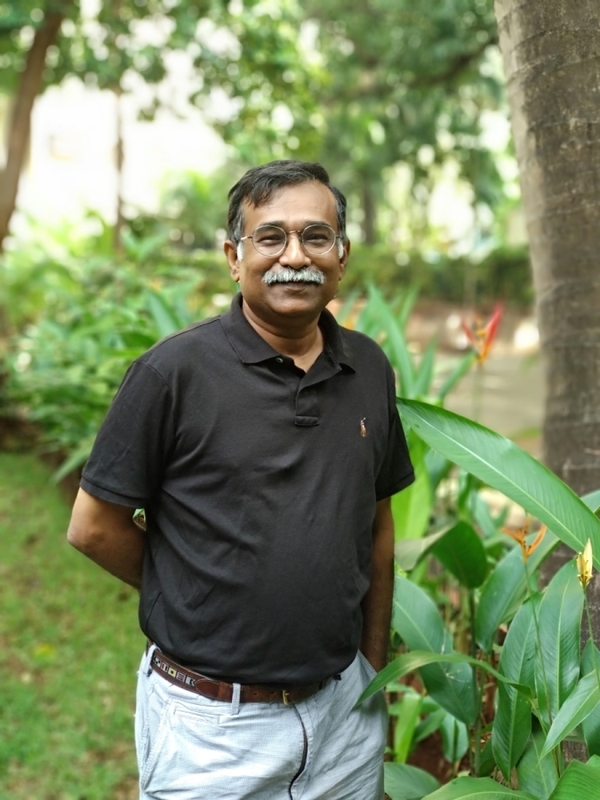 A passionate Environmentalist with a drive for conservation, Ranjan conceived the first ever Environment Education Centre at Dharavi-the Mahim Nature Park now known as Maharashtra Nature park. He was on the Advisory board of the Mumbai Municipal corporation zoological gardens (Rani Baug) and is also an accredited Associate Environmental Auditor ISO 14000. He is also the Trustee of Trailblazers Foundation and Editor of Ecotrail. Kiran as the General Manager has steered the company to make Trailblazers a market leader in the field of outbound education.She has conducted camps for more than 50,000 students, teachers and corporates from all over India. Her wanderlust has led her to train in adventure programmes focussing on canoeing expeditions in France, kayaking and windsurfing in Spain and skiing camps in Switzerland. She is also trained in Environment Education and Public Action from Israel. Kiran is an avid trekker and has led groups to Uttarakhand and Kailash Mansarovar besides leading Trailblazers skiing programmes in Switzerland, mountain biking and kayaking programmes in Japan and adventure programmes in France and Spain. 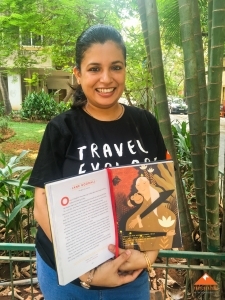 Passionate about travelling and backpacking, she has travelled extensively to Italy, Switzerland, Greece, France, Spain, Turkey, Israel, Tibet and Japan and is always dreaming of travelling. She is an advance level certified alpine skier, a painter, plant lover, trekker, adventure sports enthusiast, traveler, chef and she is all about enjoying life to the fullest. Extremely good with children, Kiran is an excellent person to be around and start a conversation with on any topic under the sun. She is also responsible for getting the Trailblazers team to start eating healthy with her mouthwatering salads. Rashmi is the Associate General Manager of Trailblazers, and a strong pillar in Trailblazers. 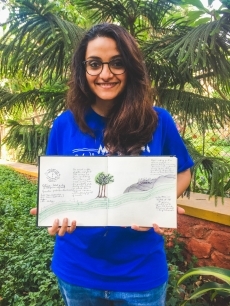 Passionate about history, wildlife and the environment, Rashmi graduated from Mumbai University in Chemistry and trained in Environment Education. With an experience of almost a lifetime, Rashmi has been conducting camps for more than 15 years! She has conducted camps for over 50,000 students, teachers, corporates across domains of adventure, culture, economics, outdoor survival to name just a few. A complete all rounder, she is a trainer for teachers and camp leaders in the field of outdoor education, and has also launched innovative programs like the Young Earth Scientist and a Zoo Conservation project with the Mumbai Zoo. A trained yoga practitioner, Rashmi has also trained in canoeing, skiing, wind surfing in France, Spain and Switzerland. Rashmi has infectious enthusiasm, and it's a challenge if you can sit next to her without smiling or laughing! Sachin holds an M.Phil in Plant Sciences and can give you a 5 minute discourse on every and any plant that you point out to him. His zest for knowledge led him to the shores of Madagascar where he studied the bio-prospecting of plants. He also has several publications in journals in the plant world. With a heart as big as his appetite, Sachin loves to work with young minds. An avid butter milk lover, he holds a record of downing 10 glasses at one go! Anyone daring to challenge him? Ojas has an MBA in Marketing and has completed his Basic Mountaineering Course from NIM, Uttarakashi. He is extremely fond of the outdoors and leaves no opportunity to miss out on an adventure. An avid trekker and biker, once you get him to start talking about his trekking experiences you would feel like packing your bags and leaving for the mountains the very next minute. Also a trained yoga instructor, Ojas is the health food freak in office. You will often find him sincerely discouraging the team from their frequent vada pavs and waffles indulgence. Armed with an MBA from IIM Ahmedabad and a Master’s in Psychology, Nitisha is certified in almost every adventure sport on the planet; Scuba Diving, Skiing, Rock Climbing, Paragliding, Surfing, and Kayaking to name a few. She also recently went on an expedition to the Everest Base Camp. 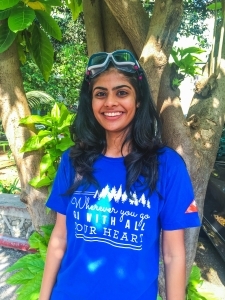 A backpacker at heart, Nitisha is an energetic and warm person, as well as a seasoned traveler- she has travelled to over 30 countries across the world and dreams of travelling to all 196 countries someday. 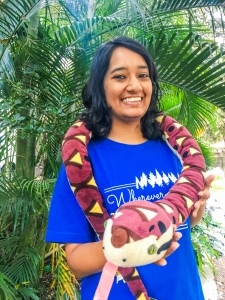 Passionate about wildlife and the environment, Nayantara has studied Indo-Pacific dolphins, and frog diversity in the Andamans. She is certified in Otter Ecology, Wildlife Forensics, and is also a PADI licensed scuba diver. In her free time, Nayantara enjoys photography, sketching and learning new languages. Nayantara is the gentlest person you will ever meet, and a calming presence on all our camps. Krusha is an outdoor enthusiast who loves travelling & meeting new people, especially working with children. A Finance graduate, Krusha has left behind the corporate world to follow her heart and work in the outdoors! 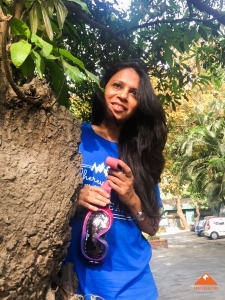 A trekker, Krusha has done several treks across the Himalayas and Western Ghats. An excellent football player, and a talented dancer, you can always find her smiling and grooving. She may look thin, but she can beat the whole team at a Misal Pav eating competition. University topper in Journalism, and Masters in Human Resources, Riya has a background of working as a lecturer at University, before joining team Trailblazers. A professional photographer and an occasionally professional singer, Riya is also an avid trekker, with over 10 years of trekking experience. 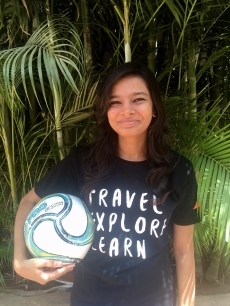 Riya loves to travel and has travelled all over India, extensively through Europe and Australia, fulfilling a lifelong dream of snorkelling in the Great Barrier Reef! When not camping, Riya spends her time learning how to play the violin, writing poetry and collecting ferns, leaves and books. Her personal book collection houses more than 300 books! Master’s in Commerce, Mumbai University, PGDM Finance, Prin.L.N.Welingkar Institute of Management and Research, Certified First Aider. Jyoti is a nature enthusiast and enjoys researching on its various components especially wild and marine life. Also passionate about adventure, Jyoti regularly takes out time to go hiking, rock climbing, parasailing, kayaking and ofcourse camping! In her free time, Jyoti enjoys classical dance, exploring historical places, teaching and photography. 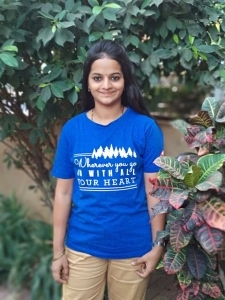 Jyoti can find an instant connect with anyone she meets, and she often volunteers in health, blood donation and cleanliness awareness campaigns. A complete pet lover, you can always find the Trailblazers office cat Pilu sitting on Jyoti’s desk. Prasad comes with a wide industry experience and is a strong back end support ensuring smooth functioning of operations. 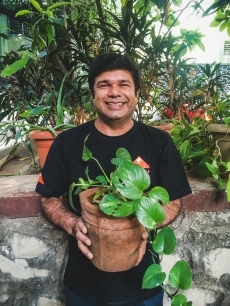 A plant lover, Prasad enjoys reading up about the plant world. 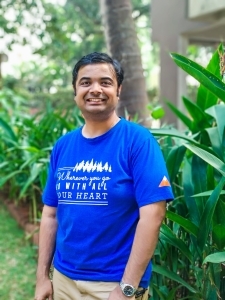 With a background in Psychology, Prasad loves to analyse and educate the team about body language and facial expressions. 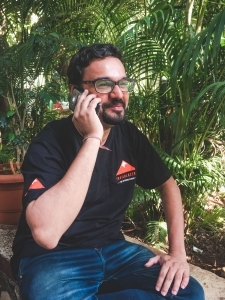 We are always in awe of how Prasad manages to juggle between the hundreds of phone calls he gets, be it from vendors or our team, and that too always with a smile on his face! Having worked with various MNCs, Amit brings in a rich & varied experience of corporate and firmly believes in team work to achieve goals. 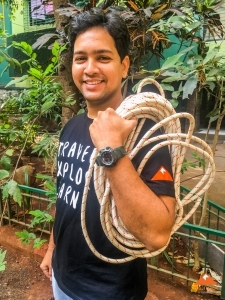 Amit is a passionate trekker having done several treks across Himalayas and the Western Ghats. In his leisure time, Amit enjoys learning and playing the Tabla and Harmonium. A complete people’s person, Amit loves interacting with people, and there is never a dull moment when he is around. In fact so much so that the Trailblazers team is constantly pushing him to start a career in stand up comedy! Trailblazers started out on a journey of discovery, learning and sharing in the summer of 1993. It was registered as a Private Limited company in 1994. The journey has since been one big learning curve full of surprises, fun and rewards with some disappointments as well. Over these 25 years, we have designed and organised outdoor programmes for some of India’s prestigious academic and corporate institutions. We designed YES (Young Earth Scientists) - a unique learning project, created for Grade 6 & 7 schools’ kids spanning 4 weekends. We received stunning reviews for our report on people's perception about the environment, on behalf of International Public Relations Association (IPRA) New York, USA. The inputs of which have now been incorporated in global communications including UN, broadcasters and the advertising fraternity. Our 12 films for Zee Television ‘Hum Zameen’ have been awarded the best television programme content & research award. Trailblazers has also partnered with voluntary organisations such as share working for street children, Yusuf Meherally Center a rural NGO, Pride India and many more. In the past 24 years we have primarily been working with students, teachers and professors largely, but now we are now fast changing! With our brand new logo, brand colours, new office, new website, we are all set to explore unchartered continents and environments beyond Europe and the Indian Subcontinent to Africa, South America, USA, New Zealand, South East Asia, China and Japan, Eastern Europe. 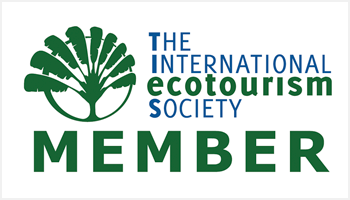 We are increasingly looking at sharing our vast experience and extending our services to interest specific groups like hobbyists, wildlifers, photographers, free individual travelers from all around the world, curating special expeditions and travel programmes which will be a combination of all the right emotions and feelings. What makes us different from any other institution is the people behind the programme. All our instructors are qualified graduates and post graduates in fields ranging from hospitality, psychology, tourism, management, biodiversity and botany. We all love India with a passion of a revolutionary and therefore our journeys with campers across India is a journey of passion where we wish to share this great nation's wealth of the past and the immense possibilities of the future just like you. We have an excellent Research & Development team which curates unique and truly life changing experiences that bring out the best of the region. Trailblazers Foundation, registered in 2014, is a voluntary organization which undertakes social initiatives in the field of environment, education & research, capacity building in schools, sustainable development, climate change, health, wild life and promotion of fundamental science amongst our society which is so focused on our gen next only moving to applied sciences. The foundation is supported in its initiative by Trailblazers Adventure Travel Pvt. Ltd., one of the leading outbound education companies in India, besides numerous well-wishers from the government, industry and the general public. Some of our award-winning CSR programmes include the “Multiply the Message” campaign for DOW Chemicals and the “PEACE Project” for Procter & Gamble. Each CSR programme is unique and very specific in nature; designed as per the aim, objectives and other requirements of our clients. A frame-work with budget, action plan for implementing the project, follow-up and benefits can be compiled along with other relevant details once the project is approved. For further details and information regarding the programmes and procedures, please do get in touch with us.